This month we will once again consider Ill. Brother Manly P. Hall’s attributes of a true Mason which we began to explore in my February message. A true mason keeps his vow/s. He must realize that failure to live mentally, spiritually and morally up to one’s highest ideals constitutes the greatest of all broken promises. A true Mason knows that his work is not secret but realizes that it must remain unknown to all who do not live the true Masonic life. Yet, if all the so-called secrets of Freemasonry are shouted from the rooftops or broadcast on the Internet, the Fraternity is absolutely safe. These disclosures reveal merely the outward forms and ceremonies of Freemasonry. A true mason is not proud of position. He is not “puffed up” by his honor, but with a seeking heart is eternally ashamed of his own place, realizing that it is far below the standard of his craft. A true Mason never feels worthy of his Craft. A true Mason cannot be ordained or elected by ballot. He is evolved through the years of self-purification and spiritual change. There are thousands of Masons who are brethren in name only, for their failure to follow the ideals of their Craft makes them unresponsive to the teachings and purpose of Freemasonry. The true Mason knows the value of seeking the truth wherever he can find it. The Masonic Lodge is universal; therefore all true Masons will seek through the “extremities of creation for their light”. He must search for the high things in lowly places and find the lowly things in high places. The true Mason realizes charity to be one of the greatest acts of Freemasonry. This means not only properly regulated charity that the Craft pursues but also the charity in his thoughts and actions. Each labor with his own tools and as a Master Mason does not spend his time in criticizing but rather in helping others to improve their tools. I trust that these thoughts about the qualifications of a true Mason have given you some things to think about and contemplate. You might not agree with everything on this subject as set forth by Brother Hall but I believe there are some measures of merit in his words that we can all use to our benefit. April means Spring Reunion time in the Valley of San Jose. Our degree teams have been working hard to get ready to welcome the new class of candidates into the mysteries of Scottish Rite Masonry. For the first time in recent memory, the Lodge of Perfection (LoP) will be exemplifying five degrees. 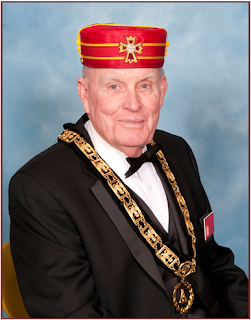 In addition to the Fourth Degree, “Secret Master” and Fourteenth Degree, the “Perfect Elu” the LoP will also present the Ninth and Tenth degrees, “Elu of the Nine” and “Elu of the Fifteen” and the Twelfth Degree “Master Architect”. Our schedule starts on the April 10 with the remaining degrees of the LoP to be presented on April 13-14. A detailed schedule of all the degree communications and conferrals can be found elsewhere in this issue. I hope you can join with us for this festive reunion of education, brotherly love, food and other refreshments.